Here's a little news from "south of the border" for all you mod-lovin' Okies. 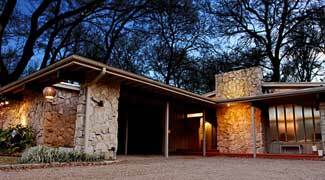 This weekend there's a home tour in the White Rock Lake area of Dallas. This is the fifth year for this event and most of the homes are Mid-Century Modern. Hours are noon to 5:00 pm on both days and advance tickets are available at area merchants. If that whets your appetite you might also want to know about the Ju-Nel Homes exhibit at the Dallas Center for Architecture. These homes, designed by Lyle Rowley and Jack Wilson, are considered modernist jewels. This exhibit kicks off in conjunction with the White Rock Lake event because many of the houses on the tour are Ju-Nel homes. A special reception and speaker forum will be held April 23rd from 6:30 to 8:30 pm and RSVP is required. After that the exhibit is open Monday through Friday, 9:00 am to 5:00 pm. Check out our Mod Map of Dallas for locations of this and other cool places!